Jesse Alston is a contributor to Writers on the Range, the opinion service of High Country News. He writes on environmental and policy issues, and lives in Laramie, Wyoming, with his wife and dog. Hunters and anglers put tens of thousands of tons of lead in our environment annually, and it is estimated that between 10 and 20 million birds and other animals — representing more than 130 species — die each year from lead poisoning. What’s almost worse is that we could get the lead out, if we wanted to. When it comes to some of my fondest outdoor memories, lead has played a leading role. When I reeled in my first bluegill, a lead split-shot hung between my hook and bobber. When I killed my first deer, 120 grains of lead brought it down. And when I caught my biggest fish to date, a four-ounce lead sinker weight held my bait deep enough for that big red grouper to find it. A golden eagle near Princeton, Oregon. When raptors and other wildlife scavenge the remains of animals shot with lead ammunition, they’re exposed to dangerous levels of the metal. But those days are over for me. These days, I think our constant use of lead in the outdoors must end. Every time we field-dress an elk or snag a lure on an unseen stump, we leave behind traces of lead that almost invariably end up in some animal’s digestive tract. And the scientific evidence is unequivocal: Ingesting lead greatly harms wildlife. Birds of prey are particularly hard-hit. Ninety percent of the bald eagles the University of Minnesota raptor rehab center admits have elevated levels of lead in their blood. A quarter of these birds suffer from full-blown lead poisoning that usually leads to death. 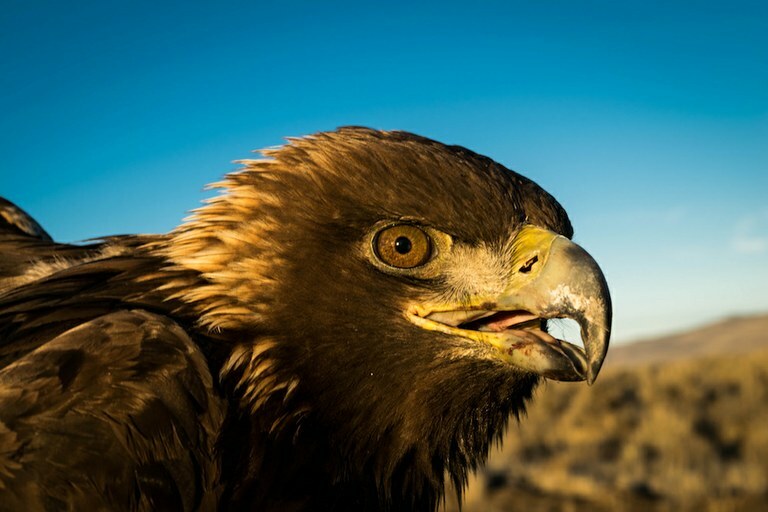 Seventy-five percent of all bald and golden eagles in or near Yellowstone National Park have elevated blood lead levels, with around 14 percent exhibiting levels high enough to cause lead poisoning. And as anyone who has ever followed the issue is aware, lead poisoning is the primary threat to the continuing existence of California condors. Most of these giant birds must repeatedly undergo treatment for lead poisoning just to keep the population afloat. Beyond raptors, lead poisoning from fishing tackle has been identified as a large factor in the decline of New Hampshire’s loons. Among game birds, 8 percent of chukars tested in Utah had elevated blood lead levels from ingestion of lead shot, and 2.5 percent of doves in a nationwide study were found to have lead pellets in their gizzards. Waterfowl still have problems with lead ingestion, and scavenging mammals like raccoons have been known to develop lead poisoning, too. If wildlife conservation is not reason enough to reduce lead use in sporting gear, we also know that lead is equally bad for human health. Nearly every box of ammo and fishing tackle carries a warning label for a reason. Even at sub-lethal levels, lead damages organs, compromises immune systems, and triggers neurological damage and high blood pressure. My fellow hunters should be aware that if we hunt with lead ammo, we’re almost certainly feeding it to our families. Lead bullets fragment on impact, and many of those fragments remain in the meat no matter how carefully we process it. A study conducted by the North Dakota Department of Health found that 59 percent of ground venison provided to food pantries contained lead fragments. Another study found that about a third of the venison from a sample of rifle-killed deer was contaminated. Wild game is a great source of lean protein, but it’s also, unfortunately, a great source of lead when we don’t use nontoxic ammunition. These days, it’s not hard to cut back on lead in our sporting gear. Nontoxic ammunition and fishing tackle are now readily available at most outdoor retailers, and they perform comparably to lead equivalents — often even better. It’s also not much more expensive, especially considering that it ensures the health of both wildlife and the folks around our dinner tables. When the United States banned lead shot for hunting waterfowl under the first President Bush, hunting and angling groups worked successfully to reduce the amount of lead used in our outdoor pastimes. I like to think we’d have gone further had we realized the extent of the problem back then. Now, however, we do know, so we face a crossroads: Do we move forward and follow the lead of past conservationists, or do we keep buying lead-based sporting gear because it’s marginally cheaper and easier? California has taken the lead: Lead ammunition will be fully illegal there starting next year. Five Northeastern states have also banned or restricted lead fishing tackle. But the rest of the nation lags well behind. We’ve even reversed some progress, as when Interior Secretary Ryan Zinke made the decision last year to repeal a prohibition on using lead ammo on national wildlife refuges. I’m not waiting around for government to take action. Personally, I’ve stopped using lead ammo on my hunts, and I’m sorting through my tackle box to get all the lead out of there, too. I hope more Westerners join me, and I encourage those who don’t hunt and fish to take action as well. It’s going to take a lot of us working together on this issue to ensure the health and safety of the wildlife and people we love.